Race 6 at HRT - Houthalen - De website van onroad-electro! It promised to be an exciting race on this small technical track. We had a sunny saturday and a lot of grip. Everyone was looking for the right setup because it was some years ago since we had a championships race here. It was new champion Olivier Bultynck who set the tone in the qualy heats. Mitchel van Es put his car on the second spot and youngster Athan De Witte was really fast and took the third spot. Because this championship was not decided yet, it promised to be super exciting. But it was Patrick Prinsen who was the fastest in front of Vincent Van Gansen and Giovanni Moguez. Also in this class Olivier Bultynck was allready the champion. But new challenger Niels Meurs did not intend to let it pass like this. 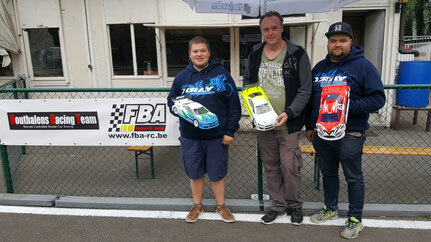 Olivier took the pole in front of Liam Van de Wouwer and Niels Meurs who tried to find the best setup for his Roche. We do not see youngsters in this class anymore but a bunch of guys with many years of experience. A lot of fun on the rustrom and a re-appearance and immediately pole position for Krist Bultynck followed by Herman Van Gansen and Harry Coenen. Efra: In the first and second final Olivier Bultynck was to strong and won with 8 and 9 seconds difference. Mitchel van Es was second, Rico Claeys third and Athan De Witte fourth. The third final was not needed for Olivier and the battle was open. Athan De Witte took a very strong start and took the lead but unfortunate Mitchel hit from behind and Athan lost several places. Due to this incident it became an unpredictable race. 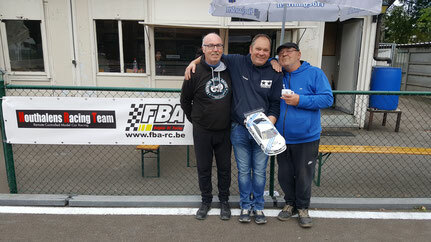 Steve Lambrechts started from fifth on the grid took the win in front of Rico Claeys and Mitchel van Es. The unfortunate Athan came back from last to fifth place. 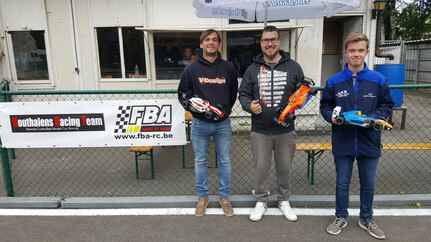 Olivier Bultynck (Awesomatix) became the overall winner, Mitchel van Es (Awesomatix) second and Rico Claeys (Schumacher) took third place. Stock: Patrick Prinsen took an big advantage in the first final when Vincent Van Gansen made a mistake and touched Giovanni Moguez. Giovanni was so unlucky and had to come back from last place. Patrick took the win in front of Vincent and Xavier Debroye. It was nice to see the battle between Vincent and Giovanni in the second final. Patrick was strong and took the win but within a second Giovanni secured his second place in front of Vincent. Patrick also took the third final, to prove his mastery on this track. Vincent made early in the race two big mistakes and Giovanni took second place. An extraordinary achievement of the youngster Alexander Van Gansen who came in as third. 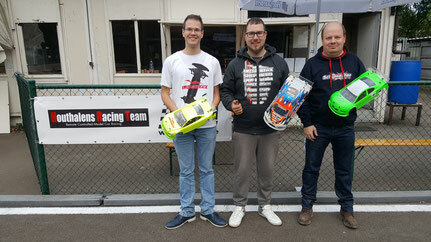 Patrick Prinsen (Awesomatix) became the overall winner in front of Giovanni Moguez (Xray) and Vincent Van Gansen (Xray) as third. Formula: It was Olivier Bultynck who took easily the first and second final. In both finals we saw a nice battle between Liam Van de Wouwer and Niels Meurs and in both Niels took second place. Because of bad luck in the second final Kris Vanbleu took third place. In the third final Olivier made a mistake and Liam Van de Wouwer took a strong start. Because of 8 minutes runs in F1 Olivier had the chance to came back but Liam was able to took the win. Olivier Bultynck (Shepherd) winner, Niels Meurs (Roche) second and Liam Van de Wouwer (Xray) third place. Rookie: This class is a fun class without any standings but Herman Van Gansen was very strong and took the win in front of Krist Bultynck and Luc Wauters.